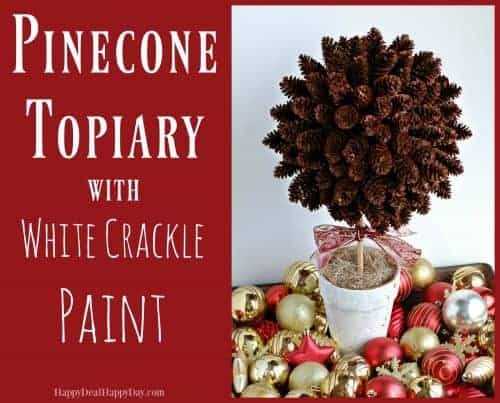 Pinecone Topiary with White Crackle Texture Paint | Happy Deal - Happy Day! 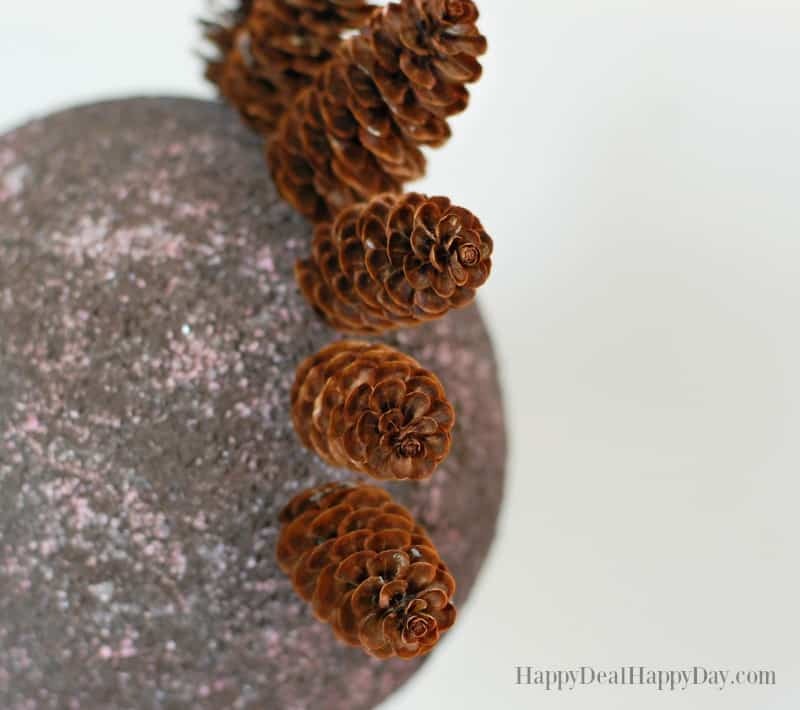 This Pinecone Topiary tutorial will show you how to bring nature indoors for a great frugal decor idea. 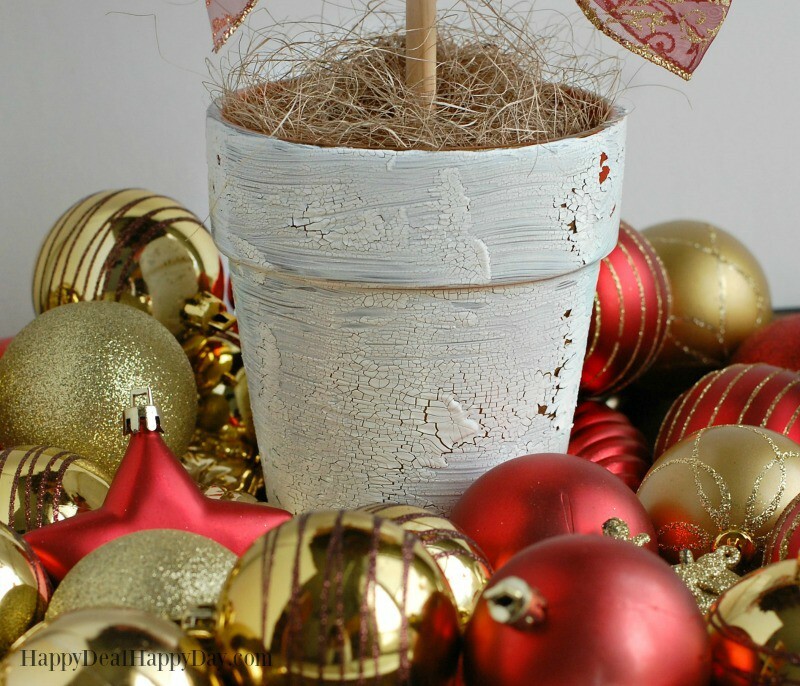 Combine that with white crackle texture paint on a terra cotta pot to make this a seasonal Christmas decoration with rustic, country, farmhouse charm! 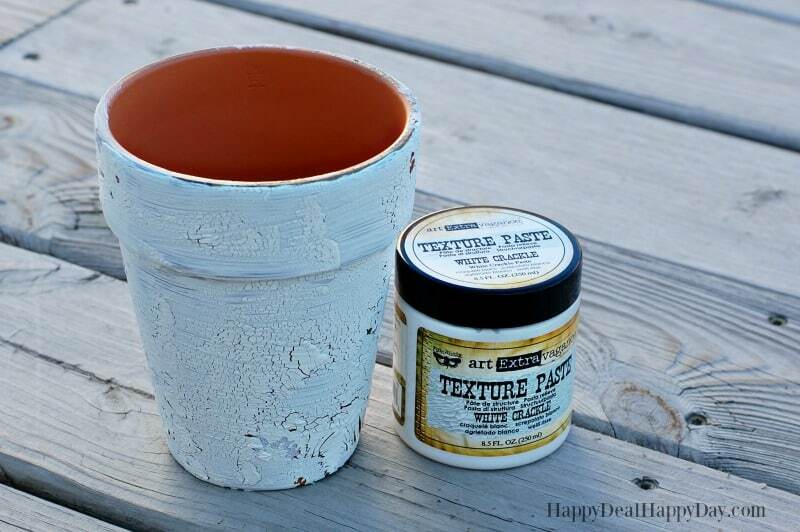 Start by using one of your foam brushes to paint on a fairly thick coat of texture paste onto your terra cotta pot. 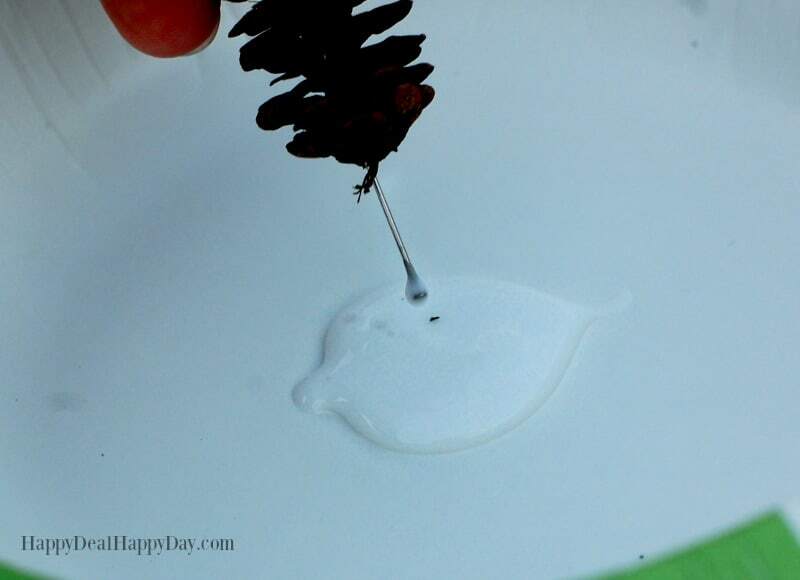 The thicker the layer of paint, the more crackle you will get when it dries. But if you make it too thick, then the crackle is bound to just fall off of the pot – so you have to find a happy medium. Let it sit and dry for a few hours. When it is fully crackled, you may need to peel off a few of the cracks that look like they are about to fall off. 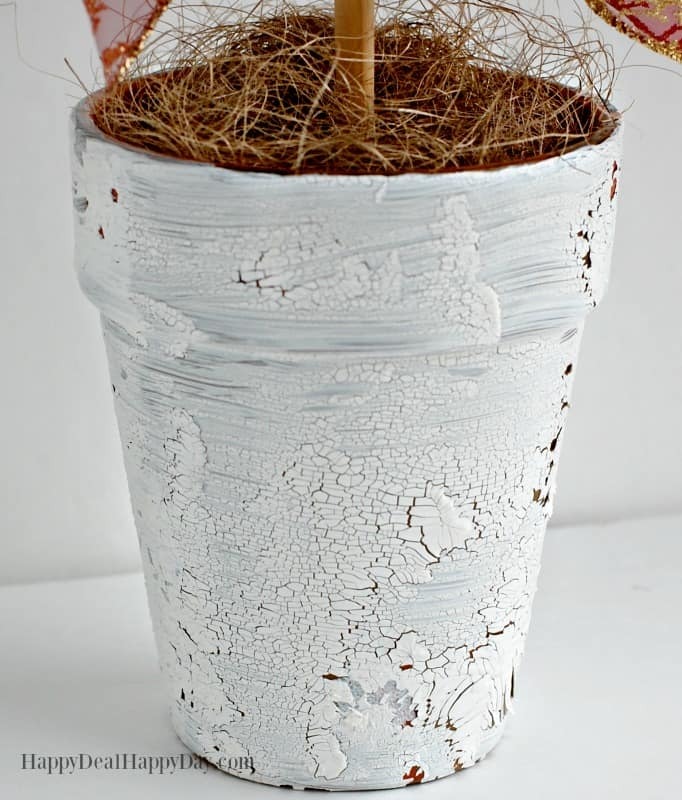 That is ok – because it adds fun dimension and texture to this pot that we want to look aged! Next you’ll need to get your clear lacquer spray paint and coat your pot. This will keep any more crackles from falling off. I recommend at least two coats of lacquer – letting it fully dry in between coats. Without the clear lacquer, the white paint will easily chip off. Once your aged white crackle terra cotta pot is dry, it is then time to start building the pinecone topiary. 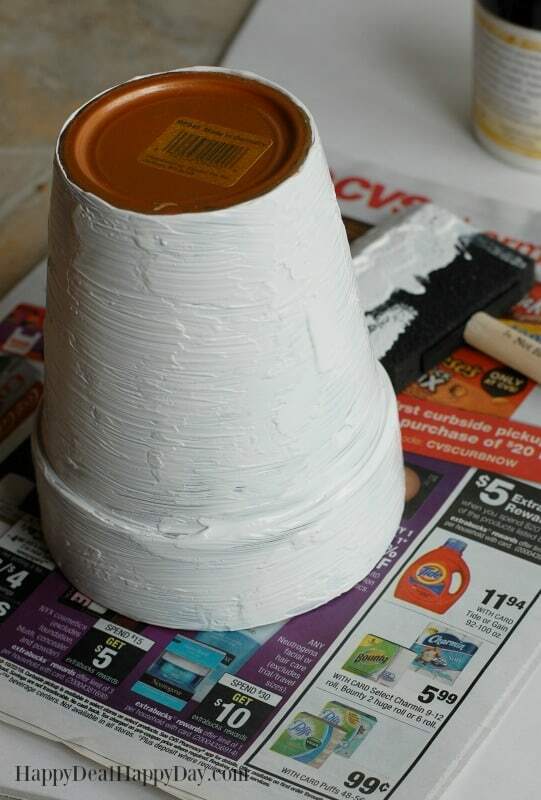 Start buy cutting your dry foam block into a piece that fits into your pot. Then take your dowel and pierce your Styrofoam ball with it in one end – and into the dry foam into the pot on the other end. A little trick that makes this easier is to take a pocket knife and whittle the ends of the dowel just a bit to create a point – which makes it much easier to pierce the Styrofoam with! Once your dowel is in place, cover the dry foam with some Spanish moss. Use your hot glue gun to keep it in place. 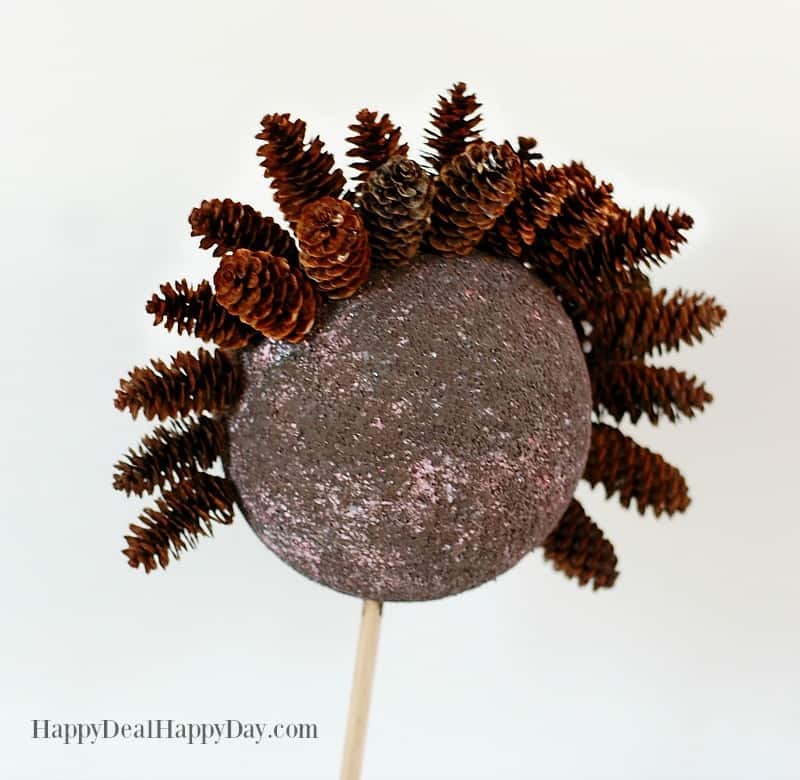 To attach your pine cones to the Styrofoam ball, you will need to insert one dressmaker pin into each. Push the sharper end into the center of the back end of each pine cone. My styrofoam ball was white to begin with. If you don’t want the white showing through after all of your pine cones are in place, then you need a healthy coat of brown acrylic paint on the Styrofoam ball. 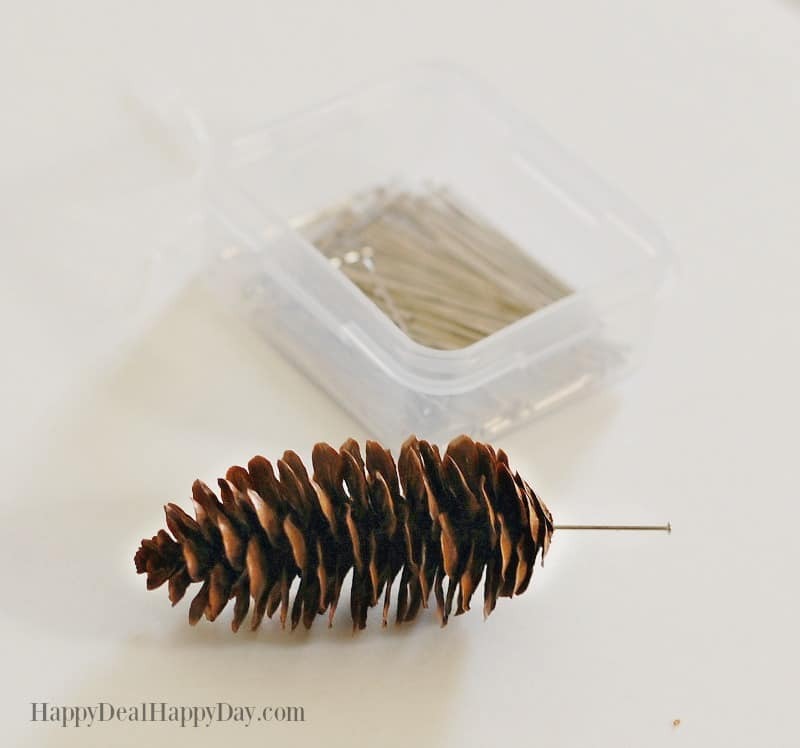 Systematically add your pine cones, one row at a time, starting in the center, and working inward until you finish one “hemisphere.” Then turn your topiary around and finish the other side. You can see here how I worked in a circular row fashion until I reached the center of each side of the sphere. 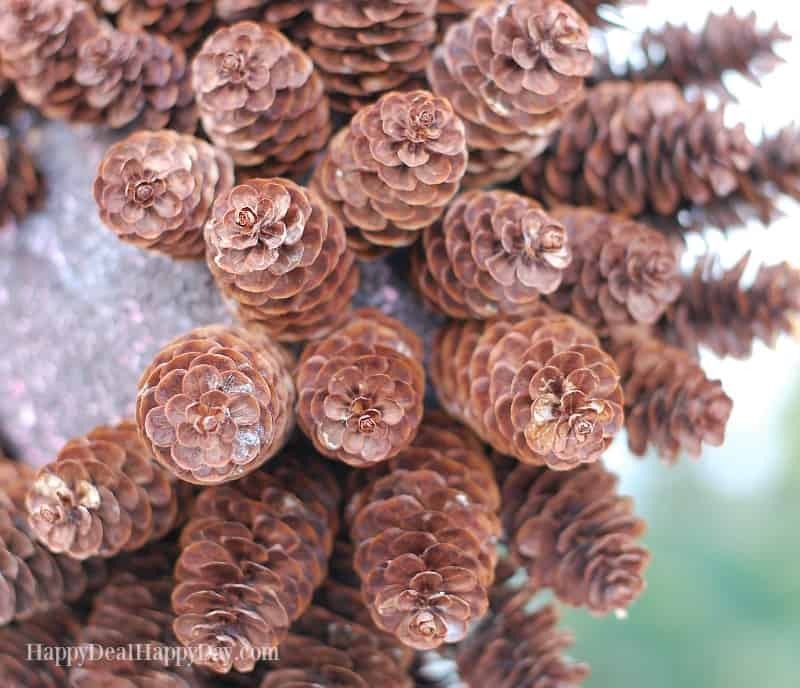 I just love the rosebud center that these pine cones have on each end! I’m using my pine cone topiary as a Christmas decoration, so I added a Christmas ribbon bow around the dowel. Pine cones don’t really go out of style though, no matter the time of year. So when January 1st rolls around, switch out your Christmas ribbon for some winter wonderland ribbon! In fact, just keep changing the ribbon no matter the season and you have a pine cone topiary that will decorate your home all year long!